University President Drew G. Faust at the Institute of Politics in early February 2018. 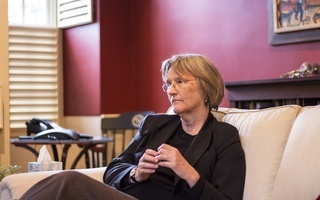 As students packed up to head home for the summer across the past few weeks, University President Drew G. Faust was also busy making preparations to move out of Harvard housing—the presidential residence, called Elmwood. Faust will officially step down from her post in June, passing the baton to President-elect Lawrence S. Bacow, who will take office on July 1. 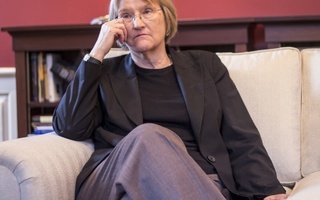 After more than a decade at Harvard’s helm, Faust will soon depart from both her Massachusetts Hall office and the historic presidential house. This summer, when Faust trades the hubbub of Cambridge for the quiet of Cape Cod, she said she will begin to think about next steps in her career. 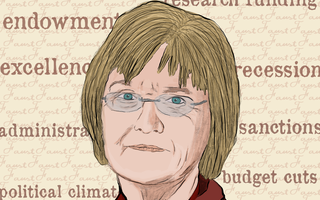 Before assuming her current post, Faust—a renowned Civil War historian—taught at the University of Pennsylvania and then served as the founding dean of the Radcliffe Institute for Advanced Study upon first coming to Harvard in 2001. 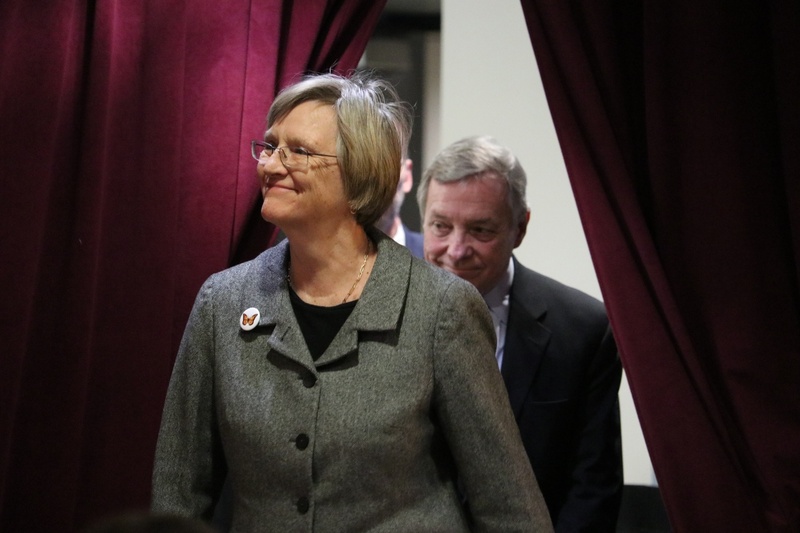 Faust said she will stay on the Cape through the fall to “reacquaint” herself with the historical literature she might have missed over the last decade as she presided over America’s oldest institution of higher learning. “I really would like to take the year to think through whether I can be a historian again, what writing project I might want to take on, how I see my voice—what my voice might be useful to think about, talk about in years to come,” Faust said. Faust called this her “non-plan” for her first year away from perhaps the most demanding job in higher education. She began her tenure at Harvard on the eve of the 2008 financial crisis, which halted the development of a new sciences campus in Allston. 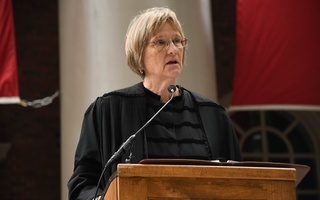 Over the course of her presidency, Faust has overseen the progress of the Allston campus, ushered in historic reforms to the Harvard Corporation—the University’s highest governing body—and prioritized fostering collaboration across the University under the “One Harvard” initiative. Faust has also been a vocal presence in both Cambridge and Washington. After the Nov. 2016 election of Donald Trump, Faust declared she would be “ramping up” her advocacy efforts. She has been an outspoken advocate on issues related to higher education, including immigration legislation, federal research funding, and the “unprecedented” endowment tax passed in December. Faust said that after she leaves her post, she wants to strike a balance between structuring her time and leaving her schedule open to whatever comes her way. “I’ve wanted to have enough of a plan so that I don’t feel completely useless, but not so much a plan as to retract my ability to take a deep breath,” she said. Reflecting on the most meaningful moments of her presidency, Faust said there is much about Harvard she will miss. 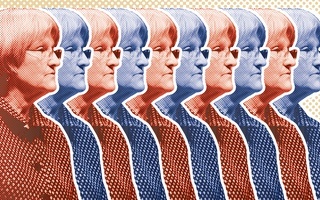 Faust said times on campus when she observed Harvard students, faculty, and staff demonstrate their ability to “just be excellent at what they do”—like watching Jeremy Lin ’10 “fly” through the air during men’s basketball games, students perform at Arts First, and faculty report on research—were the moments she loved best. “Watching the virtuosity of so many members of this community, whether it be in intellectual matters or the arts or athletics or whatever—those have been great moments,” Faust said. Faust said she especially loves Harvard’s traditions. She mentioned Commencement as an “amazing” time to be on campus, specifically recalling the 2014 ceremony during which Aretha Franklin sang the national anthem. “Harvard does rituals better than any organization I’ve been associated with,” she said. Faust also pointed to the University’s 375th anniversary in 2011 as a standout moment. Despite unexpected inclement weather including a “torrential” downpour, Faust said alumni and Harvard affiliates rallied in Tercentenary Theatre to continue the celebration. The event included a performance by famous cellist Yo-Yo Ma ’76. As a historian, however, mere reflections will not suffice for Faust. She has also been working to compile a thorough record of her presidency, slated to be stored in the University Archives. Next to her desk at Elmwood, Faust said she has been diligently collecting papers to send to the presidential archives. She added she is “really glad to know [they] can be preserved” rather than discarded. The collection will be sealed for many decades before it is available for public view, which Faust said gives her a “safety net” for both official business papers and more personal items. “I’ll be long gone before anyone can write about them and say the things that I might not want to hear based on what they see,” she said. Until then, scholars and curious students across the University can only guess at what might be contained in the collections of Harvard’s first female president—and, of course, reflect on their own memories of Faust’s tenure.